In the mid-nineties, a number of nightclubs emerged across London that were reactionary to the mainstream of Soho’s commercialized gay culture. With a DIY ethos and genre-bending music playlists, “Anti-Gay” queer clubs sought to welcome a broad church of people from the lesbian, gay, bisexual and transgender (LGBT) communities. This chapter considers the motivations, ascendancy and corporeality of “Anti-Gay” queer clubs. By contextualizing this otherwise under-researched scene, three overarching themes emerged: identity, positioning and aesthetics. 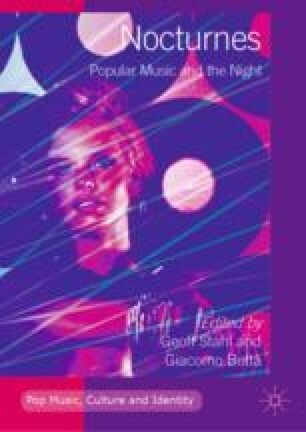 These themes are explored in reference to relevant academic literature and a reflexive interpretation of the remembered histories of the DJs, prompted and gathered through interviews. Garcia, L.-M. 2014. An Alternate History of Sexuality in Club Culture. Resident Advisor, January 28. Accessed March 14, 2018. https://www.residentadvisor.net/features/1927. Morris, C. 1999. Now Meet the Real Gay Mafia. The New Statesman, February 12. Accessed March 15, 2018. https://www.newstatesman.com/now-meet-real-gay-mafia. Robert, S. 2014. Twenty Years Ago Today MPs Voted to Lower the Age of Consent for Gay Men to 18. Pink News, February 21. Accessed March 15, 2018. http://www.pinknews.co.uk/2014/02/21/20-years-ago-today-commons-voted-lower-age-consent-gay-men/.